Hi friends, how was your weekend? We had a great one with friends; it's officially party season! Summer get-togethers are the best. I absolutely love all the food, the friends, pools, and lawn games. When we go to parties, I always try to think of new ways to thank the host or hostess. 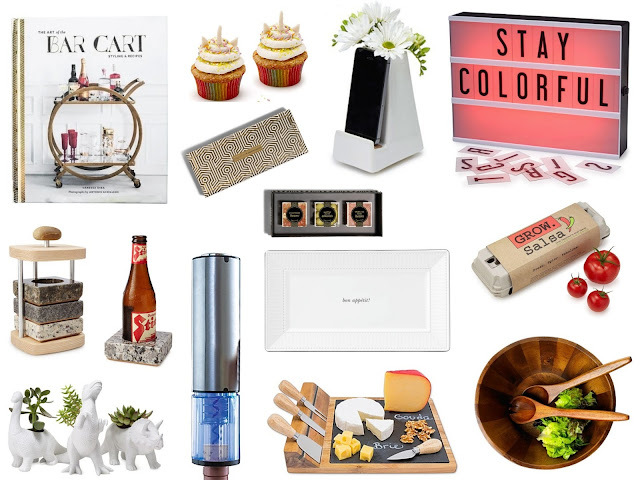 I always go with one of two mentalities when choosing a hostess gift. First, before attending, I always ask if I can bring something (a side dish, dessert, beer, wine, etc.). I text or call the party planner before showing up with a dish to make sure what I bring fits the theme of the party or meal. If the host(ess) says yes to wanting a contribution of food or drink, I try to bring a gift that guests can use with that item but the host can also keep after the event. There's nothing worse than making the party-thrower wash dishes in the middle of the party so that you can bring your serving plate home that night. In addition to bringing a new, cute serving tray that the hostess can keep, other ideas are things like the wine opener and beer caddy below. On the other hand, if the host(ess) says that there is nothing I can bring, I arrive with something just for him/her: something they can enjoy after all the guests have gone! 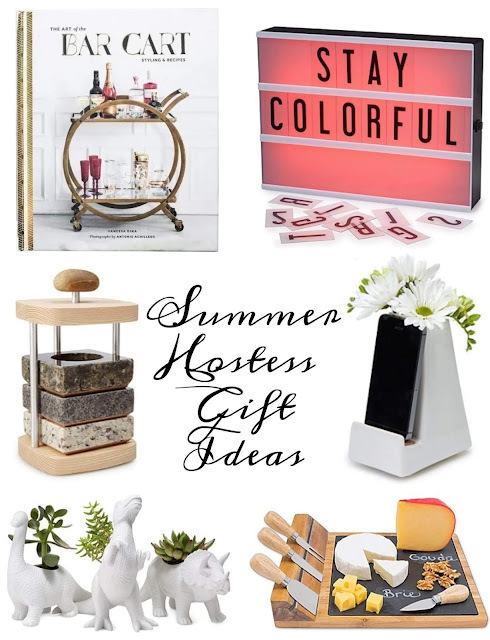 These are all such great gifts for a hostess. And things one would never really buy for themselves! I love these items! I'm definitely going to keep these as I will need to purchase a few in the coming weeks. I wouldn't be angry if someone showed up at my house with those dinosaur planters!